An Advent wreath is a ring with four candles used by some Christians and churches to mark the passing of the holy season of Advent. The candles are illuminated in succession on each of the four weeks (Saturday evenings or Sundays) of Advent. 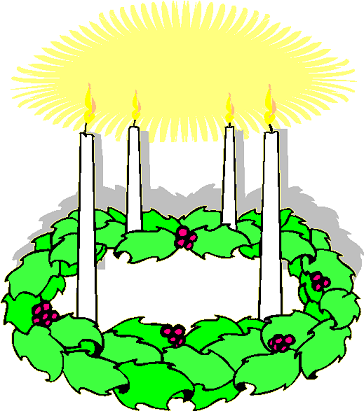 Some Advent wreaths have a fifth candle which is lit on Christmas Day to signify Christ's birth. The wreath represents God's eternity. The first candle, known as "The Prophet's Candle" signifies the hope of Jesus' arrival. The second candle, known as "The Bethlehem Candle" reminds Christians that God appeared to them in a humble manner. Bethlehem was located in the terrority of the least powerful of the tribes of Israel. The third candle, known as "The Shepherds' Candle" represents the joy that more than half of Advent is over. The fourth candle, known as "The Angels' Candle" represents the Angels' peace and the good news tat they offer. Other aspects of the Advent wreaths such as the colors of the candles are often ascribed symbolic meanings. On many Advent wreaths, the first three candles are violet, symbolizing faithful expectation, and the fourth candle is rose, symbolizing joy and hope. One story of Advent wreath, says that it was first created by Johann Hinrich Wichem, a Protestant pastor in Germany, around the mid 19th century. It is said that he created a wooden ring with 28 candles (24 small red candles, and 4 white ones for Advent Sundays) which was used to celebrate the Advent period at orphanage. Another version of the Advent wreath story says that the origin lies in the folk practises of pre-Christian Germanic peoples who, in December, gathered wreaths of evergreen and lighted fires as signs of hope in the coming Spring and renewed light. According to this story, Christians kept these traditions alive, and eventually embellished to celebrate the Advent and the birth of Jesus Christ.